Lots of landscaping work has been going on at the historic Dawson House at Broadalbin and Eighth Avenue. 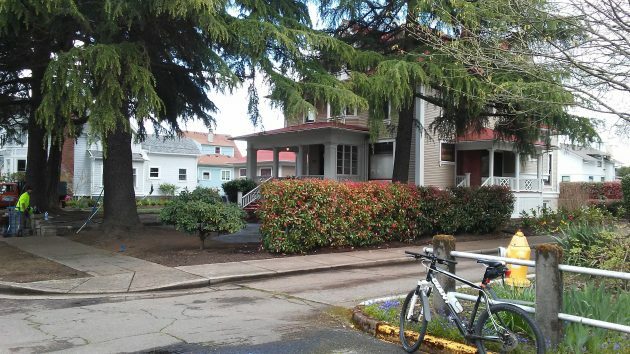 Downtown Albany will once again offer bed-and-breakfast accommodations in one of the big historic houses downtown, and the CARA urban renewal district has decided to help. Lindsay Spurlin, the owner, and her mother, Karen Spurlin, have been renovating the so-called Dawson House at 731 Broadalbin St. S.W. This week the advisory board of the Central Albany Revitalization Area unanimously endorsed their application for a five-year loan of $47,432 to allow them to complete the project on which, according to their application, they’ve already spent nearly $120,000. The house, designed by noted Albany architect Charles Burggraf, was built in 1910 for Alfred Dawson, who operated the Owl Drug Store downtown at the time, role according to material submitted to the CARA board. It is said to have 6,000 square feet including a ballroom on the top floor. Central Albany has had no lodgings for visitors since the Train House and another B&B were converted to other uses some time ago. The Dawson House project has the support of the Albany Visitors Association, which noted in a letter that the house is close to Albany Station. “With these lodging options people would be able to get off the train and walk to their lodging and explore local attractions before moving on,” wrote Jimmy Lucht, the association’s executive director. A closer look at the stately old house. It would be helpful if you would report whether CARA, a self-described ‘lender of last resort’, determined that these folks were denied private or commercial loans for this enterprise. Loaning property taxpayer money to a private enterprise is the worst way to allocate capital. The money is allocated according to a political rate of return, not an economic rate of return. They already had private financing and could borrow no more, according to their application. When the private sector won’t lend to a business, there’s usually a good reason. The lender must think the risk of failure outweighs the potential profit from the loan. Did CARA inquire why these applicants could not access more private capital (beyond what was in the application)? Should taxpayers be on the hook for this added risk? I still remember the day your Mom & Dad gave me a tour of this beautiful home. Gorgeous! I hope this Mother and Daughter have a very successful future with this B & B! I’m pleased to see the CARA board support projects such as this. My only concern with the loan is that the return not be a negative NPV. Just as the board should not be in the business of providing financial services for profit, they should not be losing money in the process. They won’t lose money. While the applicants sought a 1.5 percent interest rate, the board specified that the actual interest rate be no less than CARA’s own cost of borrowing. Remember the Labor Temple? On paper CARA wasn’t going to lose money. How many real dollars were lost on that fiasco? Perhaps a followup article is in order to show that the risks of these loans are real. Jolene Thomson had this to say on Facebook: As someone who provided supporting written testimony for the project, I did want to lightly address the comment gallery on the blog. However, when I try to leave comments I get a “forbidden” notice/error. 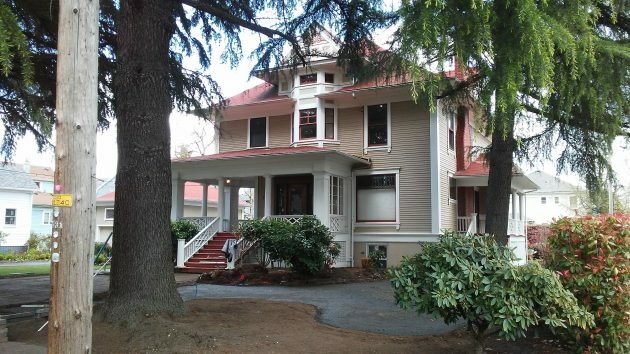 This house is a historically relevant property in the Monteith Historic District. By providing a loan- and that’s what it is, not a grant or gift, but a loan- to finish this big project, we (the community) not only contribute to regional tourism and other assorted economic development, but we also save a proverbial starfish (sea star). We won’t save every historic home in Albany- but every home we can keep intact is a feather in our collective cap. This house is particularly lovely, relevant, dramatic, and otherwise special. I wish the best to the homeowners in their worthy endeavor, and look forward to seeing the completed interior in a future parlour tour.